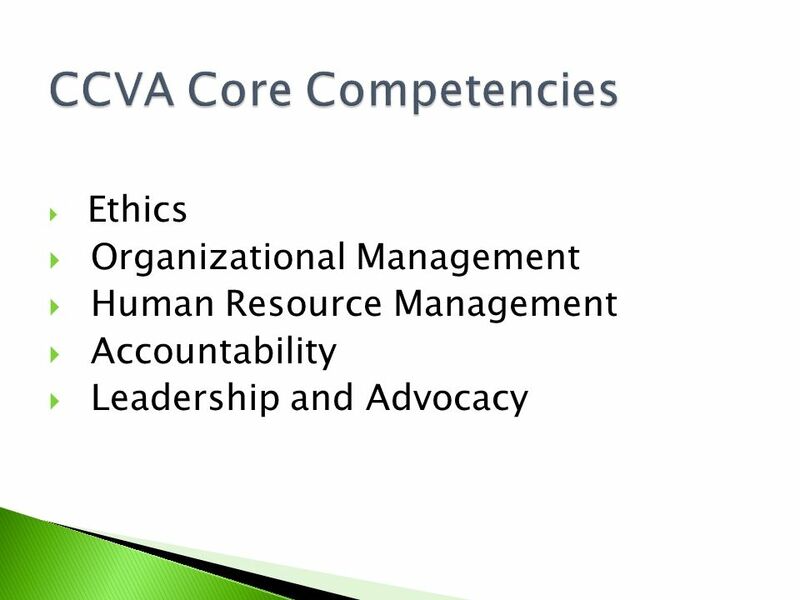 2 History Early 1980’s - First competency-based, international certification developed by Association for Volunteer Administration: CVA (Certified in Volunteer Administration) 2000 – Revision to update competencies & align with national certification standards AVA dissolves. 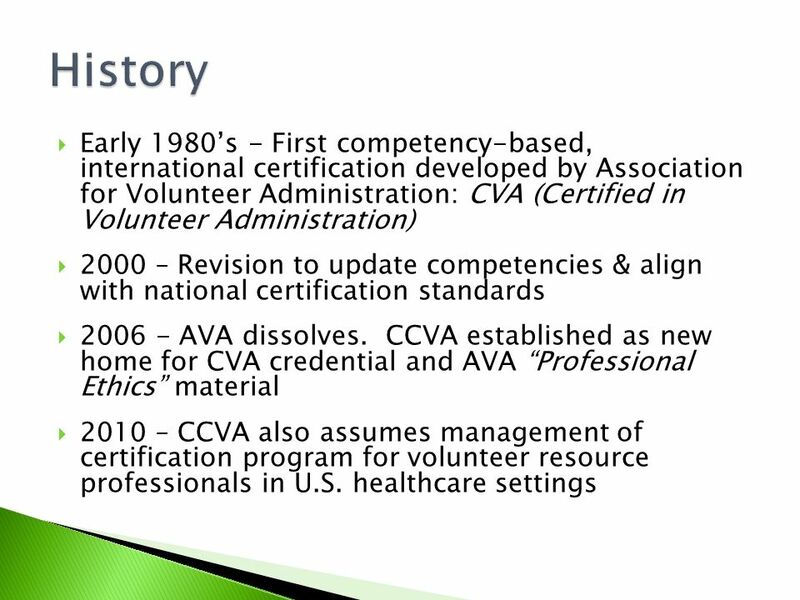 CCVA established as new home for CVA credential and AVA “Professional Ethics” material 2010 – CCVA also assumes management of certification program for volunteer resource professionals in U.S. healthcare settings History and Background Many in the audience may not know anything about the history of this program with AVA, or how it was transferred to CCVA. So it is important to share some basic information in order to build credibility for what is to follow. The CVA program has been in existence since the late1970's, when it was developed by the Association for Volunteer Administration. In 2000 the program went through a major revision. 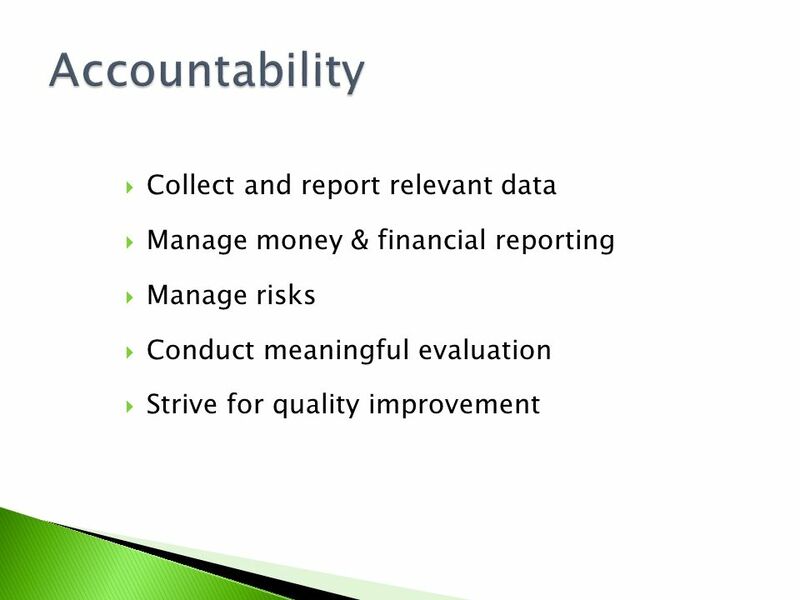 Goals of the revision were: update the competencies, streamline the process so it is less time-consuming, bring it into line with current credentialing practice in other professions, ensure accessibility to all individuals who wish to participate. In 2006, when AVA was in the process of dissolving, many were concerned that this program be saved as a critical part of our profession. After exploring many options, it was decided to create a new organization, the Council for Certification in Volunteer Administration (CCVA) as the new home for the program. Ownership was then transferred from AVA to CCVA. (More details about this are available on the CCVA website.) To date, over 1250 CVAs have been awarded, with a steady increase in the number of candidates each year. It is also important to mention that this credential has always accepted candidates from beyond the United States. There a quite a few CVAs in Canada, and there have been recent candidates from Australia, Bolivia, Bermuda, New Zealand, Japan, Slovakia, United Kingdom, Switzerland, Singapore and Saudi Arabia. First CVA awarded in Switzerland in 2013! While the process is still conducted only in English, we are committed to continuing to work with colleagues throughout the world to make it truly global. Canadian Administrators of Volunteer Resources Energize, Inc. Habitat for Humanity International Idealist.org International Association of Volunteer Efforts International Volunteer Managers Day National Assoc. of Volunteer Programs in Local Government National Human Services Assembly People First – Total Solutions Points of Light Institute & Hands On Network The Aging Network’s Volunteer Collaborative United Way Worldwide Volunteer Canada VolunteerMatch Volunteer Today CCVA’s vision is that the credential be “owned” by the entire field, not just one organization. 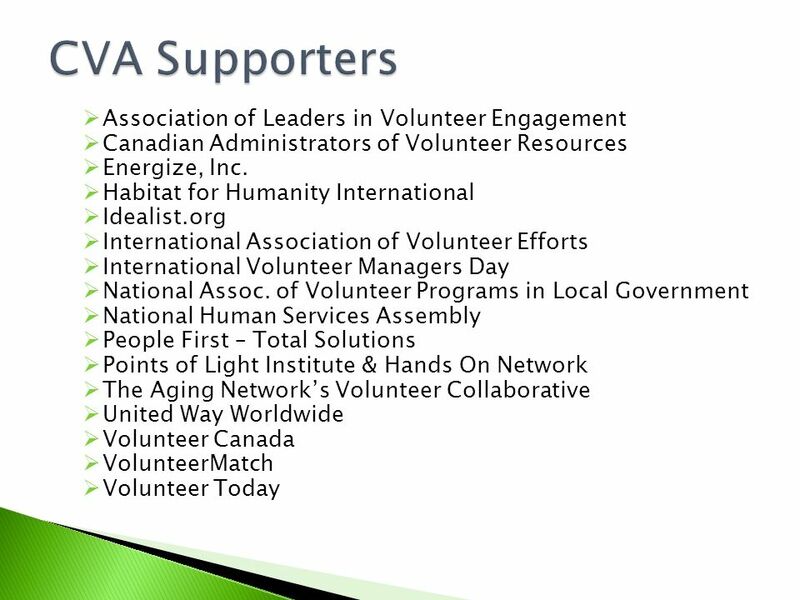 To that end, the CCVA Board includes individuals from a number of major national and international organizations. 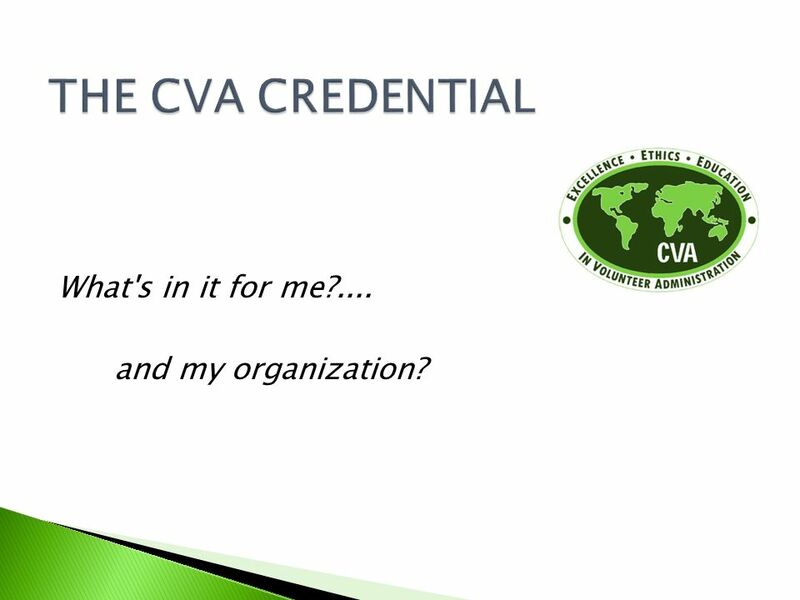 This “federated” approach ensures widespread support for and visibility of the CVA credential, all of which strengthens its credibility. To this end, we have invited a number of national and international organizations to become Supporters, in recognition of this credential as a valuable professional development opportunity for practitioners. 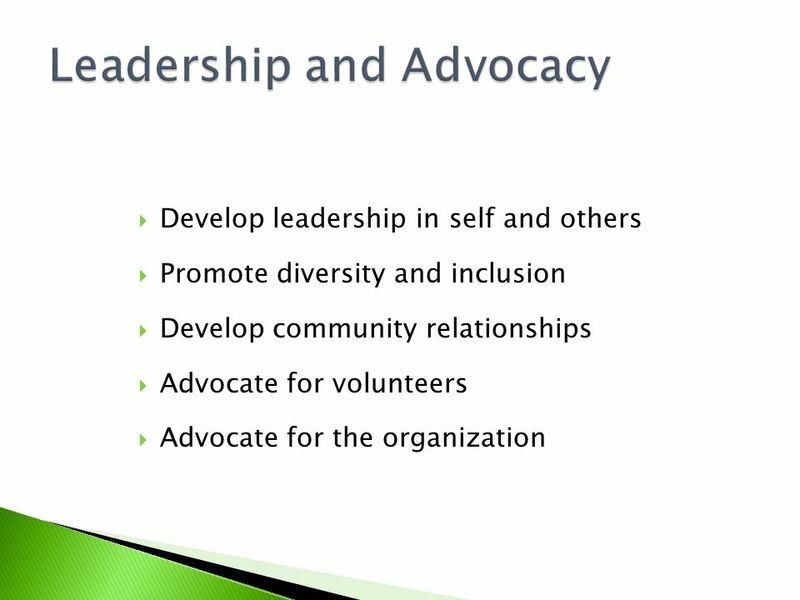 To date, these supporting organizations include …. (see list on slide). You can find links and more information about each of these organizations on our website. They are our partners in promoting the CVA credential. We continue to add new Supporters each year. 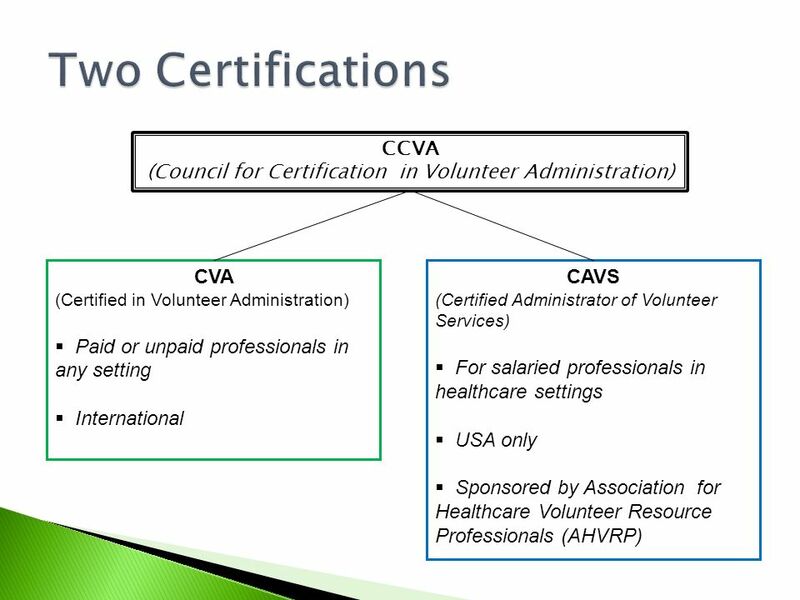 Two Certifications CCVA (Council for Certification in Volunteer Administration) CVA (Certified in Volunteer Administration) Paid or unpaid professionals in any setting International CAVS (Certified Administrator of Volunteer Services) For salaried professionals in healthcare settings USA only Sponsored by Association for Healthcare Volunteer Resource Professionals (AHVRP) An important clarification: CCVA (The Council) currently manages TWO different credentials: Information about both is on the website, so be sure you are looking at the correct section. Easy to be confused, because the initials are so similar! CAVS is specialized, intended only for those in healthcare settings; USA only. 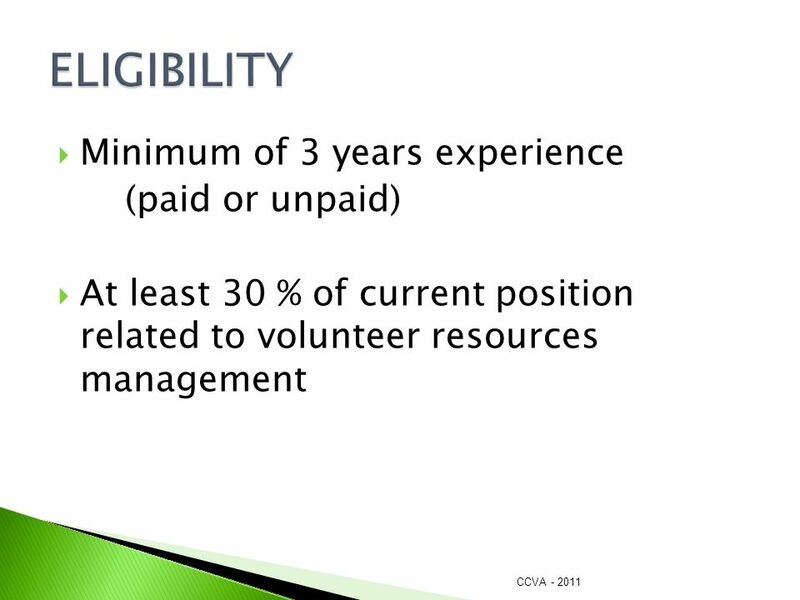 CVA is generic, intended for leaders of volunteers in any setting; international; There are differences in the requirements, the process, the timeframes, and renewal requirements. These are summarized in a simple matrix that compares the two programs. 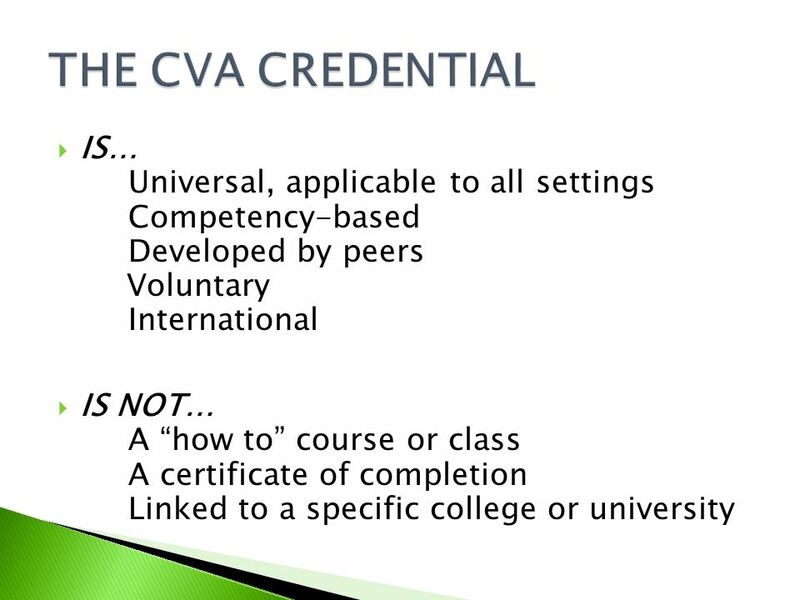 Available at The rest of this presentation focuses on the more generic CVA. 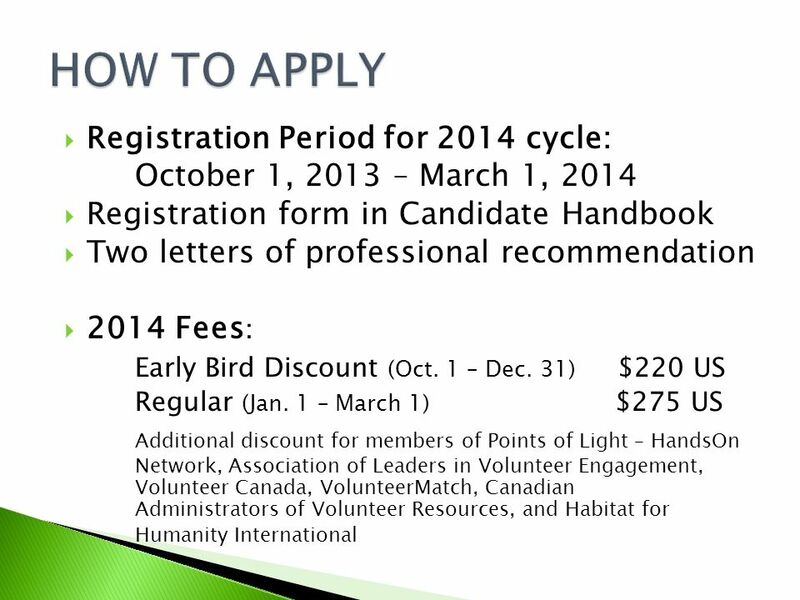 October 1, 2013 – March 1, 2014 Registration form in Candidate Handbook Two letters of professional recommendation 2014 Fees: Early Bird Discount (Oct. 1 – Dec. 31) $220 US Regular (Jan. 1 – March 1) $275 US Additional discount for members of Points of Light – HandsOn Network, Association of Leaders in Volunteer Engagement, Volunteer Canada, VolunteerMatch, Canadian Administrators of Volunteer Resources, and Habitat for Humanity International The registration process is quite simple: This program runs on a calendar year, with a new “class” of candidates each year. Registration for the next cycle began Oct. 1, and will remain open until March 1. 2-page registration form in the Candidate Handbook (available on CCVA website). Asks for summary of your experience, and that you sign a statement of intent regarding professional ethics. Must be accompanied by 2 letters of recommendation from individuals who are familiar with your work as a volunteer administrator. Letters can be brief, confirming that you are an appropriate candidate for this credential. Fees: There are two levels. Save money by registering early – and give yourself more time to prepare for the exam! Note that additional discounts are available for members of Volunteer Canada, POL-HON, AL!VE, and VOLUNTEERMATCH. Details about those fees are in the Candidate Handbook and registration form. STOP HERE FOR ANY QUESTIONS, BEFORE MOVING INTO THE DETAILS ABOUT THE CREDENTIALING PROCESS. 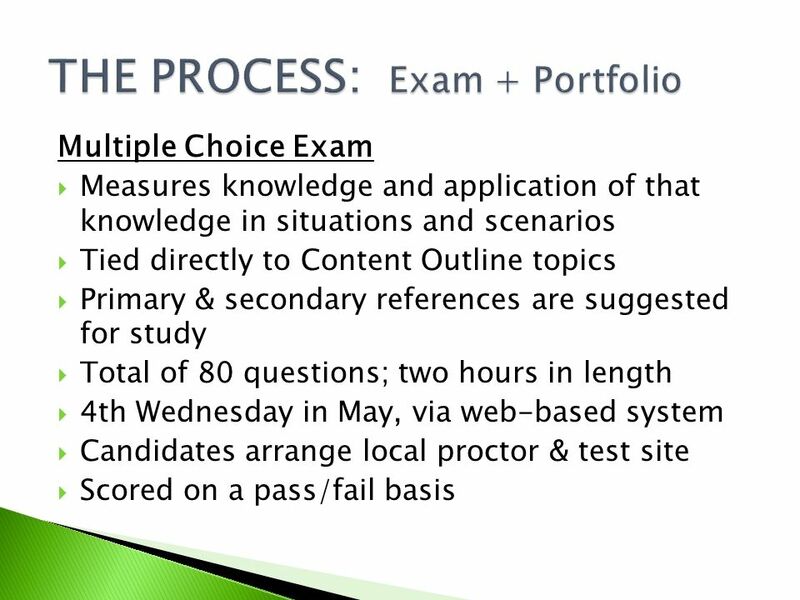 Multiple Choice Exam Measures knowledge and application of that knowledge in situations and scenarios Tied directly to Content Outline topics Primary & secondary references are suggested for study Total of 80 questions; two hours in length 4th Wednesday in May, via web-based system Candidates arrange local proctor & test site Scored on a pass/fail basis The exam has 2 types of questions, testing different cognitive levels: Knowledge and Application. More details in Handbook and handouts. Primary and secondary references are listed for candidates to use in preparing for the exam. Strongly recommend they use the Self-Assessment Tool (in Toolkit and on website) to identify which topics they need to focus on, and then study the reference material accordingly. All items (test questions) are multiple-choice, written by Test Committee volunteers who are CVAs. Offered once a year, in late May. No need to travel! Candidates arrange a local place to take the exam, and a proctor to sit with them during the exam. 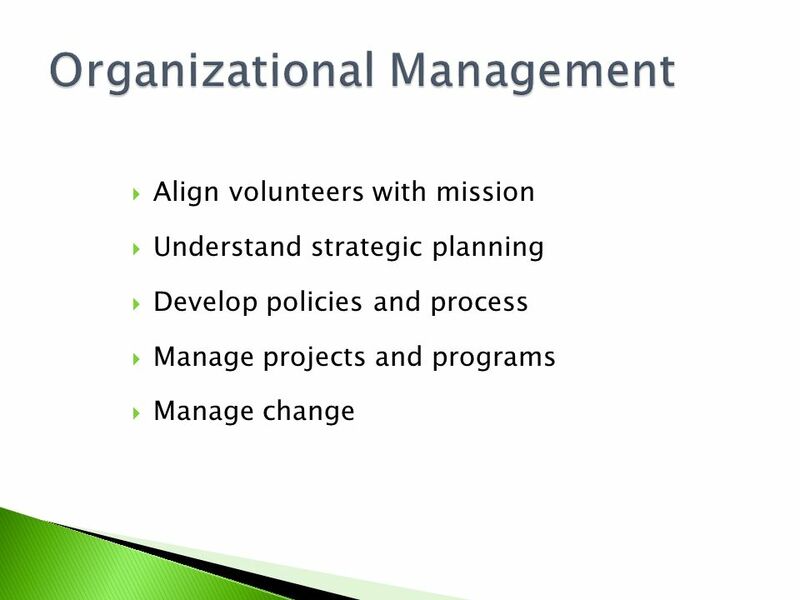 (Many use their own organizations.) The e-testing process makes the exam flexible and accessible. More details will be provided to all registered candidates, including sample test questions and study tips. The exam is scored on a pass/fail basis, using Scaled Score system. If you fail the Exam, you may take it again the following May. There is a $50 re-sit fee, but no need to re-register. This assumes that you continue working on the second part of the process, the Portfolio. 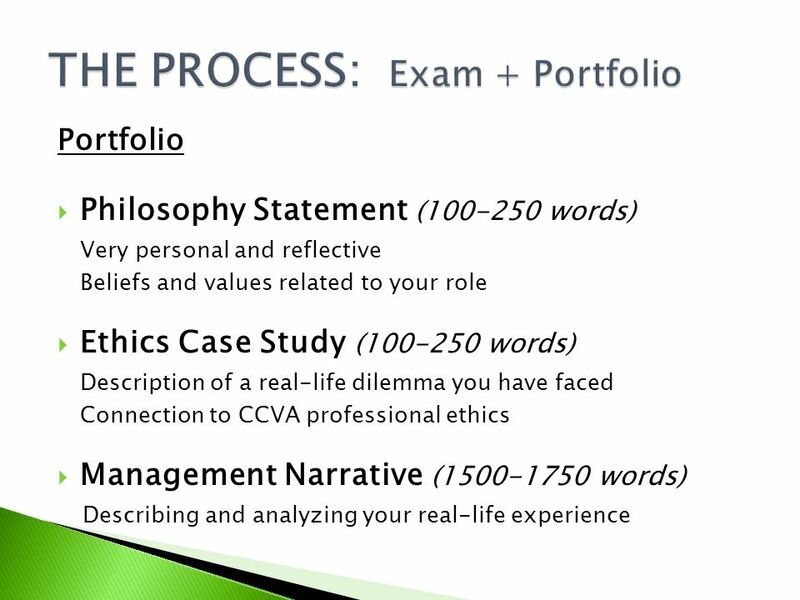 Philosophy Statement ( words) Very personal and reflective Beliefs and values related to your role Ethics Case Study ( words) Description of a real-life dilemma you have faced Connection to CCVA professional ethics Management Narrative ( words) Describing and analyzing your real-life experience There are THREE parts to the Portfolio component. Philosophy Statement: Opportunity for reflection. Very personal – not quoting others. Encourage you to “dig deep”…way beyond the organization where you currently work. Why do you care about this field, and how do you view this profession? Well written, concise = words. Many feel it is a very satisfying exercise. Ethics Case Study: Description of a work-related situation involving ethics Focus on the implications of the situation as related to CCVA professional core values Well written, concise = words. Management Narrative: Selecting a cluster of activity (or project) from your real-life experience, within the past 5 years; describe it and analyze it. (Successful or not!) Broad enough to cover the core competency areas (i.e. not jus recruitment), but narrow enough to address in words Must address very specific questions (see handout); scored based on point system. Written in the “I” voice; we want to hear your leadership, know how and way you did what you did, and the results. Demonstrates disciplined, clear, professional writing Portfolio is completed at your own pace, and submitted together. Deadline = December 31. Identifying information is removed, so scoring is anonymous. Each Portfolio is read by 2 trained CVA readers. If you fail the Portfolio, you are given feedback on what needs to be improved, and you may resubmit within the next 6 months. Helping You Succeed! Conference calls Local study-buddy or support group CVA Mock Exam online Sample Portfolio CVASupport GoogleGroup Connections to CVAs near you or in similar settings We want you to succeed, so several types of support are available: Optional calls to review requirements, answer questions, hear advice from peers. Spring, for exam. Summer, for portfolio. These are recorded for those unable to participate when scheduled. Local support groups becoming very popular. Building a track record of success in Portland, OR, Phoenix, Cincinnati, Denver, etc. Tips on how to structure these are available. Often led by one person who encourages others to join her. Great role for local professional network or group of volunteer coordinators. As soon as you register, you’ll receive a CVA Toolkit with lots more information, including a sample Portfolio. Candidates also have access to a CVA Mock Exam on-line, so they can get used to the e-testing software and resolve any technical issues prior to Exam day. 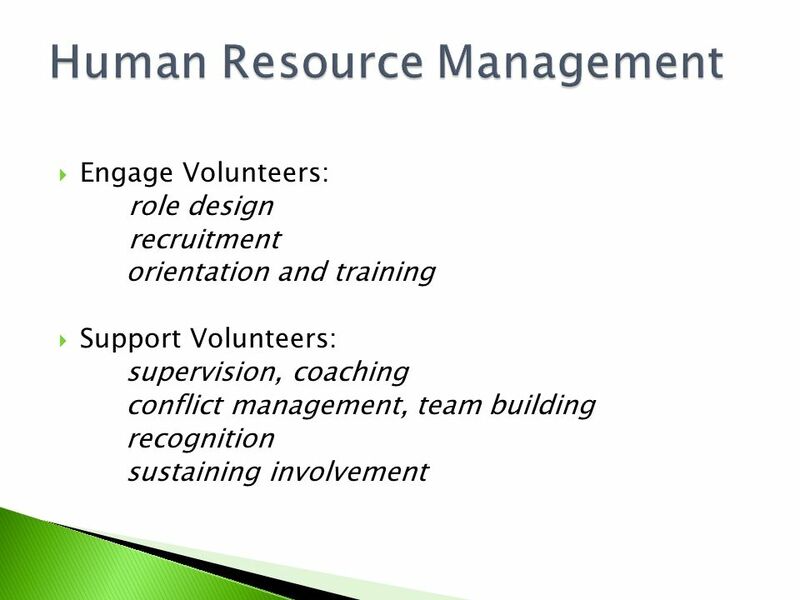 CVASupport list serve set up on Google Groups to facilitate communication among candidates. Anyone may participate to exchange tips, ask questions, and provide mutual encouragement to stay motivated and on schedule. We are always willing to help you connect with other CVAs in your city or state, or who work in a similar type of organization as you. This can help you feel less isolated and more confident. 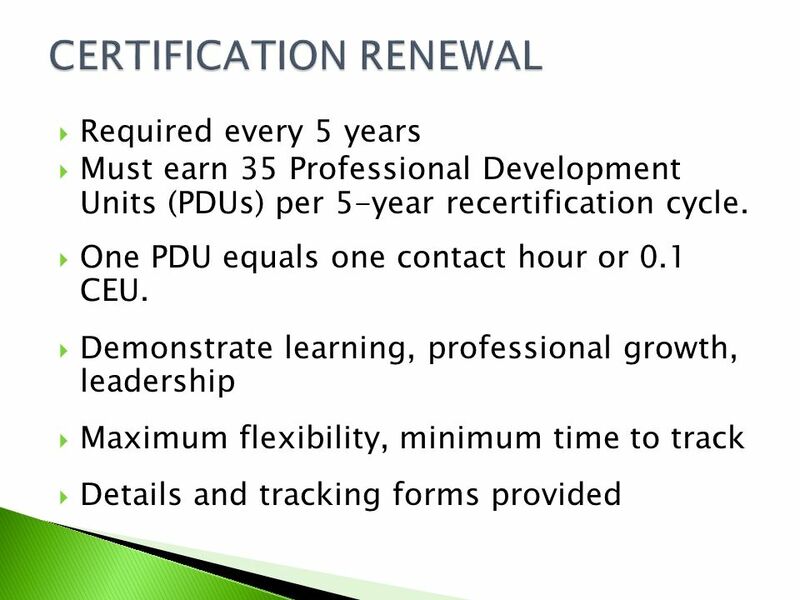 Required every 5 years Must earn 35 Professional Development Units (PDUs) per 5-year recertification cycle. One PDU equals one contact hour or 0.1 CEU. Demonstrate learning, professional growth, leadership Maximum flexibility, minimum time to track Details and tracking forms provided Certification Renewal is the norm among most professions today. 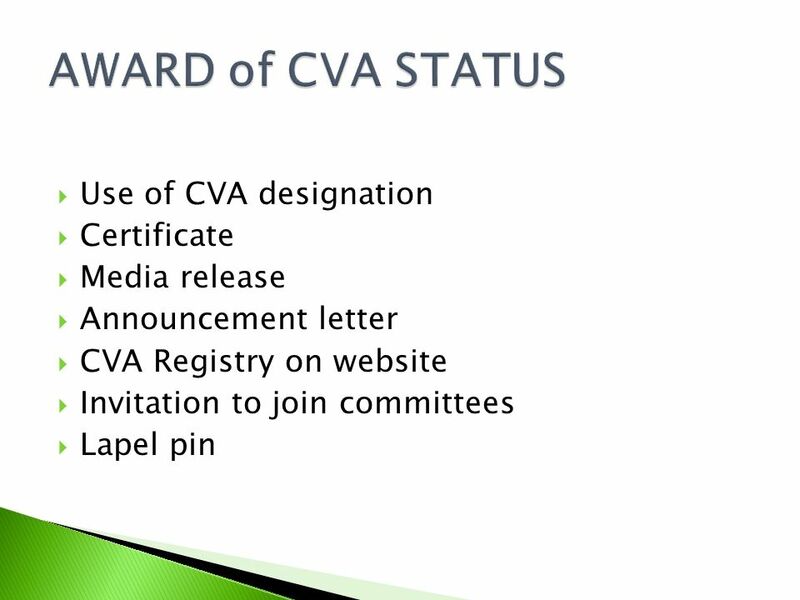 Once earned, the CVA credential is valid for 5 years. This was determined to be manageable, and appropriate – given that this profession doesn’t change as rapidly as more technical fields. Goal = to show continuous learning and growth, and activity in the field Primarily keeping track of what you would be doing anyway. PDUs can be earned a variety of ways – training or teaching, writing an article, serving in a leadership role, workshops or conferences. Many more details, plus tracking forms, provided upon CVA award. Also available on the website. 19 THE CVA CREDENTIAL What's in it for me?.... and my organization? These are some of benefits CVAs have shared about their experience with the program. Ask the participants: Why are they considering this? What would they hope to gain? How might it benefit you personally , and/or your organization/employer? Enhanced credibility Learning through self- assessment Increased commitment Transferable validation of knowledge and skills Affirmation of current practice These are some of benefits CVAs have shared about their experience with the program. Ask the participants: Why are they considering this? What would they hope to gain? How might it benefit you personally , and/or your organization/employer? 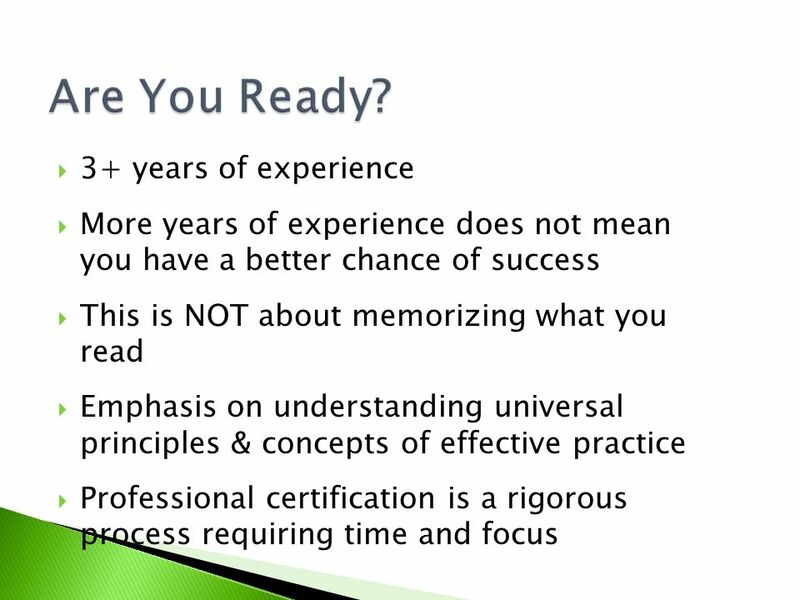 More years of experience does not mean you have a better chance of success This is NOT about memorizing what you read Emphasis on understanding universal principles & concepts of effective practice Professional certification is a rigorous process requiring time and focus Based on what you’ve heard today, do you think you are ready to make certification a professional goal? The requirement for at least 3 years of experience is essential because this is a competency-based process. That being said, lots of experience does not guarantee success. In fact, sometimes long years of working in the field can be a disadvantage because you will more naturally jump to assumptions that they way you’ve been doing something in your own job is how it would be done everywhere. The Exam is designed to assess your understanding of effective practice no matter where you might be doing volunteer management. It is not enough to “know” the facts – certification is aimed at determining who “understands” the concepts as they might be applied in the real world. Some candidates think that all they have to do is read and memorize the CCVA textbook information, and they will pass the Exam. In fact, it is possible to pass the exam without reading that book at all! Information about universal best practices is available from many sources. 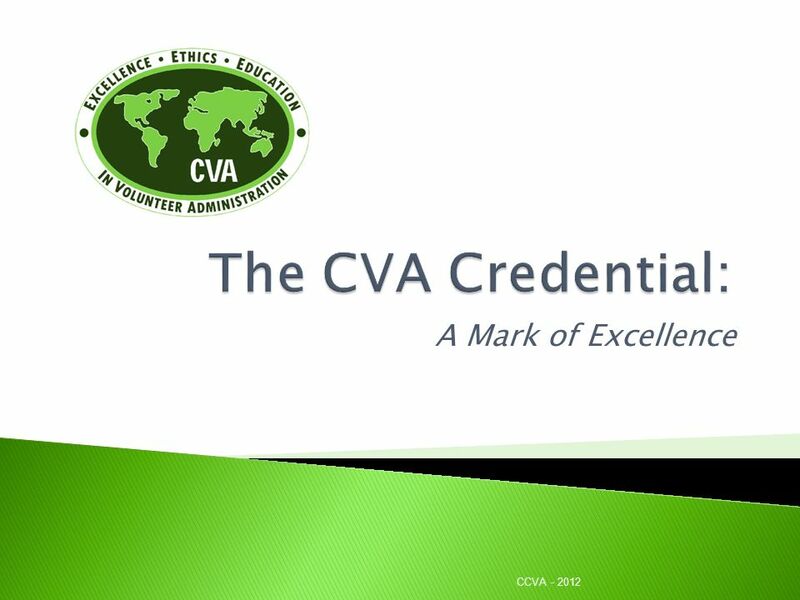 As with any professional certification, the CVA program requires time. You need to fit it into you life to allow adequate attention, and take it seriously. When you are ready, we’ll be here to support you! 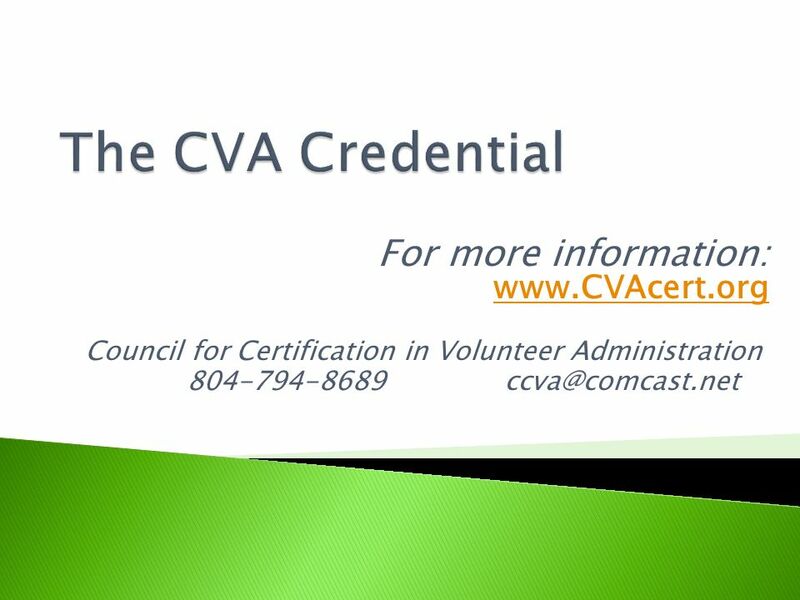 The CVA Credential For more information: Council for Certification in Volunteer Administration ADDITIONAL QUESTIONS about the process? Or anything else I’ve covered? Will this be the year you make it your goal? Full details available via the CCVA website, or by contacting the office. Feel free to call or anytime. Very willing to discuss your particular situation and questions. Download ppt "The CVA Credential: A Mark of Excellence"
Certified School for Improved Performance - Indistar® (CSIP-I) The Institute for Performance Improvement. UCSC History. UCSC: A brief history 60s University Placement Committee A lot of field trips/interaction with employers. Pursuing Effective Governance in Canada’s National Sport Community June 2011. A Practical Guide. The Handbook Part I BCCC Vision of Assessment Guiding Principles of Assessment Part II The Assessment Model Part III A guide on how. “Putting the pieces together – as a community”. Certification recognizes the experience, knowledge and skill of an individual as measured against a standard. Elevate Your Nonclinical Staff to National Professional Status. February 2014 What is a CNL ® ? The Clinical Nurse Leader SM (CNL) is a fast emerging nursing role developed by the American Association of Colleges. Summer Institute, May16,  Peer review process that evaluates educational programs and services for quality.  Transferability of credit hours.